Chapter 6 described the physical properties of representative examples of attitude hardware. However, to use sensor output or to predict control performance we need specific mathematical models of the hardware and its output. Various models encountered at NASA's Goddard Space Flight Center are presented in this chapter. The hardware and its mathematical model should be thought of as distinct entities. It is possible for the hardware to be refined or modified without requiring a change in the mathematical formulation. Similarly, it is possible to refine or improve the mathematical model even though the hardware has not changed. For example, the horizon sensor models in Section 7.2 implicitly assume that the sensor responds instantaneously to a change in intensity as the sensor scans the sky. This concept was used for spacecraft supported at Goddard Space Flight Center prior to the launch of SMS-2 in February 1975. With the rather good data from SMS-2 it became apparent that the anomalous behavior of the data when the scan crossed only a small segment of the Earth could most easily be explained in terms of the finite response time of the sensor electronics. The mathematical model of the sensor electronics presented in Section 7.3 was subsequently developed and greatly improved our understanding of the data. Thus, the continuing development of both hardware and mathematical models can proceed at least somewhat independently. In this section, we will derive general expressions for data reduction and simulation for two classes of Sun sensors: slit sensors for which the measurement is the fraction of the spin period required for the Sun image to traverse a slit pattern, and digital sensors for which the measurement is the linear deflection of the image of a narrow slit upon traversing a refractive medium. A V-slit Sun sensor used for spinning spacecraft normally contains two plane field (PF) sensors making an angle 90 with respect to each other. Each PF sensor has a planar field of view (FOV). 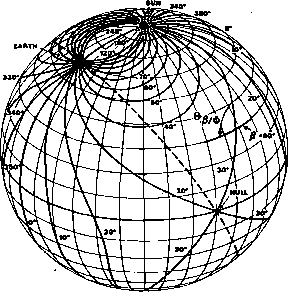 Thus, the projection of the FOV onto the celestial sphere is a segment of a great circle. The sensor provides an event pulse whenever the FOV crosses the Sun. 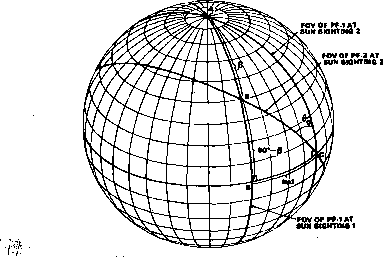 Therefore, the Sun angle, /?, can be obtained directly from the measurements of «, the spin rate, and A/, the time interval between the two Sun-sighting events from the two PF sensors.